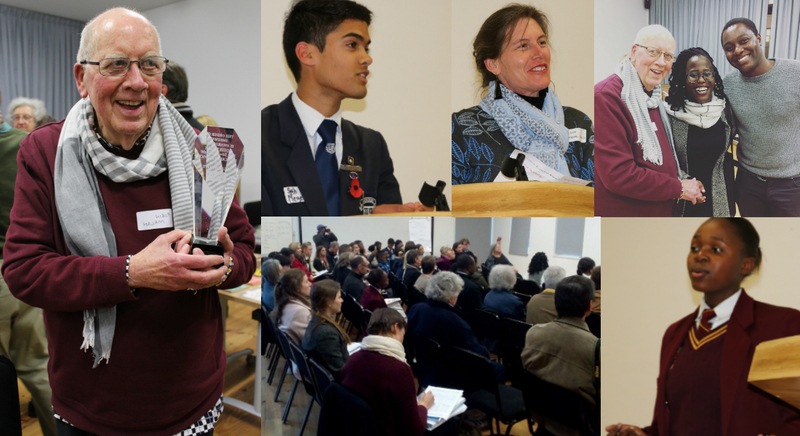 This year’s launch of English Alive was graciously hosted by Herschel Girls School on Wednesday, 22 August 2018 and saw readings from Amber Adams (Herschel Girls School), Seth Meyer (Wynberg Boys’ High School); Shana Paulus (Pinelands High School), Thandile Mqikela (Masibambane Secondary School); Emmanuel Abiodun (Westerford) and Taine de Nobrega from (CBC St John’s Parklands). The dynamic author of An image in a mirror, Ijangolet Ogwang, was our wonderful guest speaker on the night and inspired us all to look beyond the obvious. This year’s edition was co-edited by Robin Malan and Twanji Kalula, with the assistance of Naeelah Kamaldien and Sharon Sheldon. English Alive 2018 features 61 pieces of poetry and prose from 35 schools in Southern Africa. It features front-cover artwork by Siphesihle Tsabedze (Waterford Kamhlaba United World College, eSwatini). Robin Malan and Terrill Nicolay were both awarded a new award – the Order of Imbewu – for their contribution and service over many decades. “Imbewu” means seed and illustrates the way both Robin and Terrill have operated to nurture a love for the English language in different ways. Robin has been involved with English Alive for more than 50 years, and Terrill Nickolay has been involved with SACEE for more than 30 years and served as Chair for more than two decades. Although Anne Schlebusch has formally resigned from her role as a SACEE Committee member, she will remain a valuable part of the SACEE community and we are very grateful for the depth of her institutional knowledge. Roger Graham, who has organised the Forum Discussions for many years, hopes to retire next year. Both Roger and Anne have been active SACEE members for more than 30 years!